Now that winter appears to be in our rear-view mirror, our garages will be under quite a bit of turn-around. Out come the garden tools and the lawn mower, and into storage go the ice melter, shovels, and the snow blower. 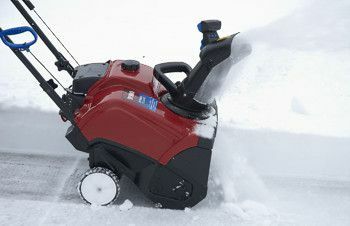 In doing so, it is important to “summer-ize” your snow blower before pushing it to the corner of your garage in storage. A few simple steps will ensure that your snow blower starts up on the first pull next winter! 1.) Drain gasoline inside the engine: This is the most important step with snowblowers, especially so with the newer 4-cycle snow blowers, which do not use an oil/gas mix. The easiest way to drain the engine (fuel tank and carburetor) of gasoline is to “run it dry”. To do so, you will turn the snow blower on and let it run out of fuel. This will dry up the the engine so that the old gas doesn’t deplete and absorb water (both of which make your engine hard, if not impossible, to start next year). The other option is to drain the engine of fuel through the carburetor. There will generally be instructions on how to perform this step in the owners manual. 4-cycle (no mix) gasoline that is used in your snow blowers can be poured in your car for use. 2-cycle (oil/gas mix) and 4-cycle gasoline can both be used in spring power equipment with like gas mixtures! 2) Use up old gasoline: This point is an extension of the first step. Not only do you need to use up the gasoline inside the snow blower, you will also want to use up the gasoline in your gas can. If 2-cycle, it is often best to run it through the snow blower. If 4-cycle gasoline, then it is often best to pour it in your car. The general rule of thumb is to never use gasoline that is more than one month old in your small engines. 3) Replace spark plugs and check for worn parts: The spark plug is generally easy to replace and can be done with a deep socket wrench. If you do not own one, you can purchase an inexpensive one for a few dollars in our automotive department. It is recommended to replace spark plugs once a year. Also, you will want to check the scraper and paddles, which become worn and may start to limit the effectiveness of your snowblower’s ability to lift and toss the snow. If your snowblower is a Toro or Lawnboy brand, our service department will be happy to perform all of these steps for you! Consider bringing your snowblower to us in the spring, so that it can be summer-ized and prepared for next winter season by one of our experienced mechanics!